Such a strong, happy family! Meet Cradling New Life’s newest twin girls Charlotte & Reece! These girls made their appearance at 33 weeks gestation after mom was on bedrest for 5 weeks. Reece has been home from the hospital since the beginning of October. Her sister however, was born with a heart condition that required surgery and a longer hospital stay. 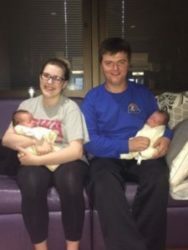 It was difficult for these parents to take only one baby home and still visit one in the NICU. Charlotte is anxiously awaiting for her chance to go home. We can’t wait for this family to be home together soon!